Minutes after the Lightning nearly capitalized on a boneheaded play by Corey Crawford, they were on the wrong end of a bad play of their own. 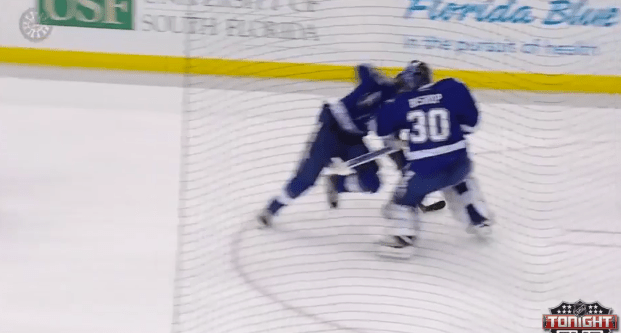 Ben Bishop and Victor Hedman collided in open ice after the netminder inexplicably came way far out of his crease to make a play on the puck. 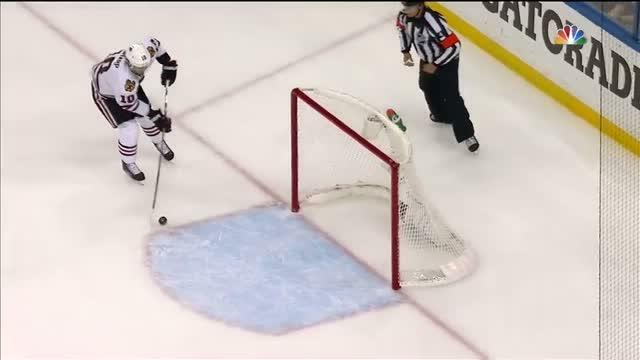 It would result in the easiest goal Patrick Sharp has scored in the playoffs, putting the Blackhawks up 1-0 in Game 5. Perhaps Hedman didn’t see (the gigantic) Bishop? Maybe there was a miscommunication between the two? We’ll have to wait for the post-game to find out exactly what happened by way of some nondescript sports cliche. Bishop stayed down on the ice for a minute before going back to his crease with the trainer. His dinged-up pride might have been weighing on him more than any sort of injury. This is Bishop’s first game back in net after leaving Game 3 and missing Game 4 with an undisclosed injury. The series has been relatively low scoring for these two teams. If this sticks as the game winning goal… Well, Tampa is probably more forgiving than, say, Canada.